I've implemented the scenario below using all ASA/PIX features for high availability. The failover has been set to be stateful, authenticated and to replicate HTTP sessions. This type of replication might result on a high load on the network link, thus it is only recommended to be used when the HTTP sessions state must be kept and the failover link is dedicated. A redundant interface pair has been set to the primary internet connection (ISP1). The inside interface is also on a redundant pair. The secondary internet link uses only one physical interface. It is important to note that redundant interface members couldn't be configured with subinterfaces and no nameif can be set. All the security-level and IP addresses are automatically cleared. When the active member of the redundant interface fails, the secondary member takes the active role. This feature does failback, so if the interface assigned to the index 0 returns from a failed state, it gets back to the active role. redundant interface Redundant1 active member Ethernet0/0 admin becomes down. redundant interface Redundant1 switching active from Ethernet0/0 to Ethernet0/1. Send gratuitous ARP on Redundant1. redundant interface Redundant1 switch active to Ethernet0/1 done. redundant interface Redundant1 switchovered to member 1.
redundant interface Redundant1 stby member Ethernet0/0 admin becomes up. active member Ethernet0/1 is already up, no further action. redundant interface Redundant1 switching active from Ethernet0/1 to Ethernet0/0. redundant interface Redundant1 switch active to Ethernet0/0 done. Moreover, it results on a device failover. It happens because the command monitor-interface makes the system to monitor the redudant interface state, not the physical interface state individually. So we cannot set the failover to happen just when all members of the redundant interface fail. The default route that forwards traffic through ISP1 is monitored with SLA Monitor. If the monitoring fails, therefore, the route is automatically replaced by the secondary (the one with higher administrative distance). 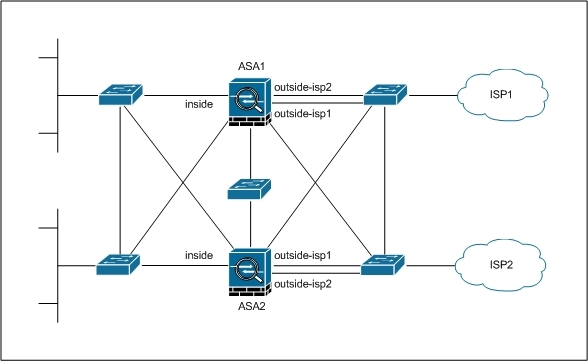 The NAT settings follow this replacement, however for some inbound traffic (e.g., connections to SMTP servers) we need to have additional resources to keep the services running (e.g., BGP). I used the next hop address to monitor the link state. We could use some Internet known address to monitor the state of the ISP path instead of only the local link to the ISP. In this case the target address must be always available. If the monitoring gets back from a failed state, the firewall swap the routes again since the primary one has lower administrative distance (failback).